In the interest of full disclosure, I have to admit that this review came about in a strange fashion. I was on a popular online bookstore website (amazon.co.uk) and I thought “Hmm, I wonder what is popular right now?” I brought up the bestseller list, expecting to see a sea of Naruto volumes. Instead, around 4 out of the 10 top spots belonged to this series, with the latest volume taking the top spot. I had not previously heard of this series, and wondered what all the interest could be about, so I bought the first volume sight unseen. To be perfectly honest, I was not expecting much of this title, given the recent trend of poor quality vampire-based media, and my hopes were not raised after reading the rather bland blurb on the back of the volume. In short, there are two sets of students at Cross boarding school — a set of normal humans (who all appear to be female barring one or two exceptions, strange that) and a set of vampires who have a separate dorm and come out for lessons at night. The main character, Yuki, who already knows of the existence of the creatures from being nearly killed by one when she was younger, helps to protect both the vampires and the normal students as part of a disciplinary committee. The humans must be kept in the dark in regards to the existence of vampires, as well as be shielded from any vampire who gets hungry for hemoglobin. The plot is fine as it is and works well to set up the world — the one complaint I have is that in every single chapter the manga spends time reminding you of this established world, which gets tiresome very quickly. The pace can be inconsistent, with a lot of possible plot threads slowly brought to light while the main character goes through a series of massive, unexpected events. This jarring change of pace just as you are getting to know the character deadens any impact the event would have normally had. The characters highlighted in this first volume are well realized, with one notable exception being the main character, Yuki. While Yuki is portrayed as being highly knowledgeable, she comes off as irritatingly dense and oblivious at times, frequently failing to gauge the gravity of a situation and putting herself in grave peril as a result. This is not helped by the fact that the entire cast absolutely adores her, wanting desperately to drink her blood/hug her/both at the same time and leaving you to wonder what exactly they see in the cute little airhead. While I desperately wanted to like Yuki, I found myself wishing that one of the male characters was the main protagonist, as he seemed to have his head on straight even if he was a seething pile of angst. I can only suppose that Yuki was designed in this fashion to be the reader's viewpoint on the events in the manga — something that is not fully successful due to her frequent dumb moments. Many more characters are hanging around in the shadows to be properly revealed later, a move I liked, as it allowed me to get acquainted with the core characters without being burnt out on introductions. The art in Vampire Knight is well drawn, focusing primarily on the characters and their painstakingly designed school uniforms. The volume even has a set of design instructions for potential cosplayers (Looking at this, it would cost you a fortune in rose-shaped buttons. ), showcasing the huge amount of thought put into the designs. The level of detail becomes almost pornographic at one point, when you have a main male character with a stream of blood on his neck and torn shirt — something for the ladies, I guess? The characters, in particular the vampires, share a similar character design style and I was a little worried about being unable to tell them apart when the majority of the cast was introduced in a single panel, but thankfully they contain enough individual detail and personality that this is not a problem. There are some issues with the art — sometimes the character proportions or perspective are jarringly off, which has the potential to pull you out of the story. A larger annoyance is that the character's eyes remain the same in each panel. For example, Yuki has wide-open eyes and they stay that way with little change, almost as if they had been copied and pasted into each panel. The whole cast is a victim of this off-putting phenomenon, which and robs facial expressions of emotion and makes the characters harder to differentiate. 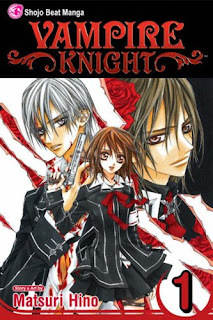 All in all, I was rather pleasantly surprised by Vampire Knight and found myself enjoying the read, especially during its lighter moments. While I would not be opposed to picking up the following volumes to see how things develop, I am rather hesitant due to the frustratingly clueless behavior of the main character. Maybe it’s just me, but if your earliest memory was being almost murdered by a slavering and gore-drenched vampire, you might display a bit more hesitation around the creatures than Yuki displays. I would certainly say to have a look at the first volume to see if it grabs you — especially if you are a fan of impossibly pretty, aloof vampire boys, although this is not a necessity. This review is based on a Shojo Beat release from Viz Media purchased by the reviewer.